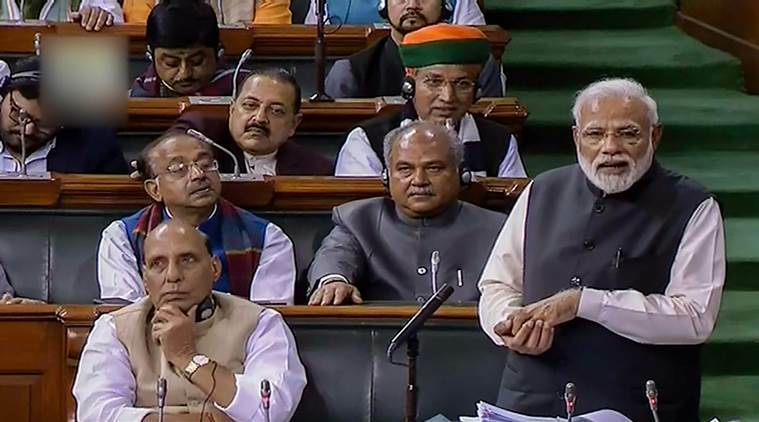 Replying to the debate on the motion of thanks on the President’s Address in Parliament, Prime Minister Narendra Modi on Thursday launched a blistering attack on the Congress over a host of issues and alleged that those who imposed Emergency, “bullied” the judiciary and insulted the Army were levelling allegations against him of destroying institutions. In his almost two-hour long address, the prime minister also fired back at the Congress over the Rafale issue, which has been repeatedly raised by its chief Rahul Gandhi. PM Modi alleged that the grand old party did not want the Indian Air Force to be strong and asked “which companies are they bidding for that they are acting so shamefully”. “Congress does not want our Air Force to become powerful. I am levelling a serious allegation,” the prime minister said in his address in Lok Sabha. His retort came hours after Gandhi, at a Congress event in Delhi, described him as a “darpok” (coward) and dared him to a five-minute face-to-face debate on issues such as Rafale and national security.